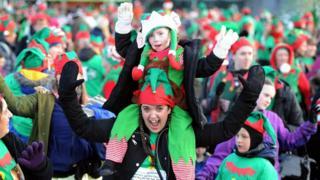 Hundreds of people have joined in with Newcastle and Gateshead's first elf walk. The event was organised to raise money for research into Alzheimer's disease. It was run by the Alzheimer's Society, which hopes to raise £60,000 to fund research and support affected people in the Newcastle area. Many of those taking part said they had loved ones with the disease which is the most common cause of dementia in the UK.